The Festival Grounds are the work of countless individuals and have slowly evolved over time. We are honored and grateful for the space that evolves out there and are so happy to share it with you during the festivals. 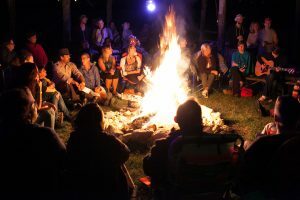 Center Fire is the place people congregate in the evenings to share stories and songs under the open prairie sky. 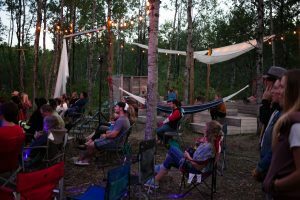 It is proudly sponsored by Firewood Manitoba – who provides a gorgeous safe space for cooking and campfire. To know the story of Center Camp, also recognized as an “arbor”, you must know about Uncle Dave. Uncle Dave, the then 75-year old Uncle of Maurice lived on an acreage out by Neepawa, MB. 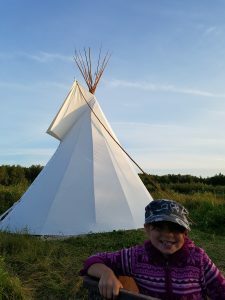 On that acreage Uncle Dave has created all sorts of fun adventures including a camp kitchen house and a center camp-like fully enclosed building. 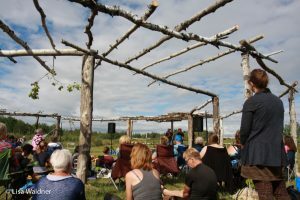 He wanted to share some of his ideas on the Festival grounds so, of his own idea, he milled some trees from his property, loaded them up on his flat deck trailer and drove them out to the Festival Grounds. There he started the project, along with Maurice’s dad, Robert, of creating the outside structure for a Center Camp. The big idea was to put a roof on the structure with a hole through the middle for the flames to flicker out, but by the time the circle posts were tamped in, the size of the project was much too daunting and the open circle had a peaceful quality about it. The decision was that no roof would be put on. To finish the shape and feel of Center Camp, close friends of Maurice and Tracy’s, known as “The Village”, came out and spent an afternoon, hauling and cutting trees and completing the inner circle. It was an incredible project and Center Camp was born. The Tipi was a donation to the grounds from dear friends from the United States. However, respecting the origin of the Tipi and needing to learn more about it, the Thibodeau’s enlisted the help of Dakota Chief Wanbdi Wakita to come out and perform a smudge ceremony, to teach the meanings of the Tipi and the responsibilities of the Keeper of the Tipi. It is a beautiful space and meant to be a symbol of cultural appreciation. We highly encourage all of our guests to review Tipi etiquette and the history of the Tipi from a credible resource. A list can be found here but we highly recommend the book “The Indian Tipi: Its History, Construction and Use” by Reginald and Gladys Laubin. Back from a trip from Burning Man, Maurice had visions to add additional structures to the grounds and with the help of a friend, Anne-Marie, a dome was found on Kijiji. 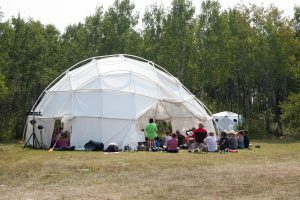 You’ll find the dome is a part of other festivals as well as it tours Manitoba, offering a unique quiet area for contemplation. 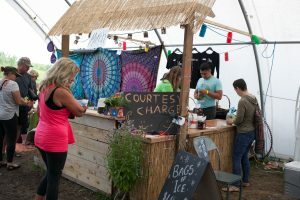 As more and more people came out to celebrate on the festival grounds, groups of individuals wanted to contribute to the space. The Bird Sanctuary is the gift from a beautiful soul name Iah who comes from south of Winnipeg to maintain each year for the festival season. You may recognize the Hive, a gift from TK, Devlin and crew, the Hive was brought to live on the Festival grounds after collecting many memories on the Folk Fest campground. Each year, the crew comes out to re-beautify it for the guests of the festival grounds. What’s a get away without a touch of the island life? The Mister “E” Bar is the gift of Eric, a man of many talents who spent the better part of two days creating this masterpiece where you’ll often find various merchandise articles for sale or maybe grab a cup of coffee. 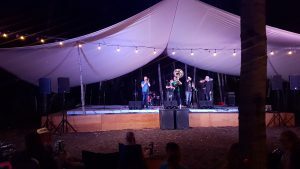 This stage gathered many memories before coming to rest as the Stage in the Woods on the festival grounds – large enough to easily host a 10 piece band, it provides a captivating experience for guests as they take in workshops and music. The Main Stage tarp cover travels back and forth to Burning Man each year where it provides shelter on the Playa and then requires hours and hours of clean up to get the playa off. One summer, a man who was travelling around decided to hang out for a while. While he was here he had the most fun putzing around here and there and creating spaces for individuals on the festival grounds. You’ll see one of the carefully thought out spaces as you wander the campground space on the West Side. There are many people behind the scenes that contribute their gifts to the festival experience. One of those individuals who must be named is Frank. He has been a major factor in building out the festival grounds and you’ll take Frank’s Way to get your RV out to the grounds.